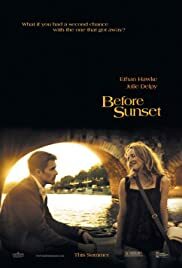 A sequel to the 1995 film "Before Sunrise". Jesse (Ethan Hawke) and Celine (Julie Delpy) meet 9 years after their initial meeting. They've changed--originally they were in their 20s and full of idealism. Now they're in their 30s--and their lives have changed in ways they didn't predict. Like the first movie they walk around Paris this time and talk about love, life, reality, what might have been--and it's all fascinating. Like the first film this is basically a character study and (like the first) just incredible. It's like catching up with old friends after 9 years apart! They've aged a lot--Hawke looks TERRIBLE but Delpy looks OK--and life has thrown both a few hard knocks but hearing how they survived and what they went through is just incredible. This is NOT for everybody (four people walked out when I went to see it) but, for people who can deal with nonstop talk for 80 minutes it is just great. Every single line rings true and is delivered full force by Hawke and Delpy. The acting varies--Hawke is good (but he smiles WAY too much)--Delpy is just superb all the way through. This is easily one of the best films of 2004. Highly recommended. 135 of 173 people found this review helpful. Was this review helpful to you?